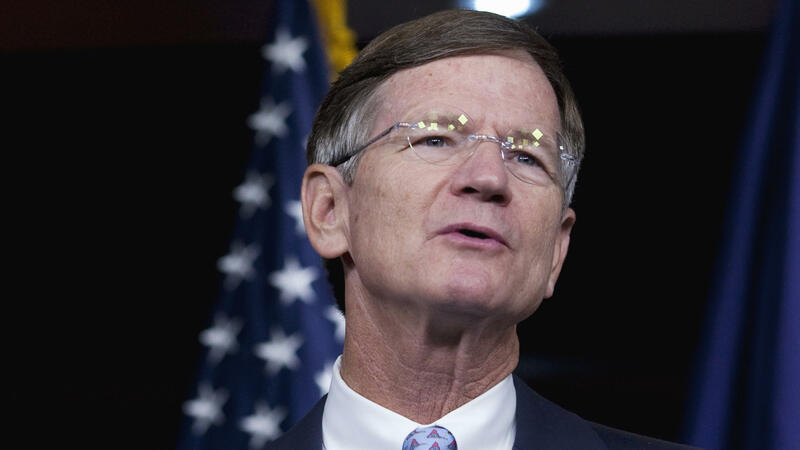 GOP Rep. Lamar Smith has held the House seat in Texas' 21st Congressional District since 1987. His retirement has sparked a fierce race for his seat for the first time in decades. Many voters in Texas' 21st Congressional District seem to have their minds made up about the midterm elections, even though some don't know the names of the candidates. For the first time in decades, Democrats are energized about their chances to take a longtime-Republican congressional seat in Texas this fall. Since the 1970s, the 21st Congressional District has been solidly in Republican hands. Incumbent Rep. Lamar Smith has held onto the district, which includes a large portion of Austin, for more than 30 years. But Smith is retiring at the end of this term — and with signs of a possible wave election for Democrats, Smith's exit has sparked hopes on the Democratic side. "This is the part of the state that was Republican before Republicans were even a major factor in the state," said Sean Theriault, a political science professor at the University of Texas. In these midterm elections, Democrats are looking to take back control of the House, which would break the control Republicans have of Congress and the White House. This is a race that doesn't top handicappers' lists — the Cook Political Report rates it as Likely Republican. So if this race were to go blue, it could indicate a very big wave on Election Night. But Democrats are scoping out this district, because its political demographics have shifted over the past few elections. President Trump won it by 10 points in the 2016 election, which was was already a shift from 2012 and 2008 when Mitt Romney and John McCain won it by more. "That gives Democrats a shred of hope that former Army officer Joseph Kopser ($337,000 on hand) could pull off an upset in a wave," David Wasserman, House editor for the Cook Political Report, wrote in an analysis of the 21st District's rating. These are the kinds of districts that could see an unintended consequence of political gerrymandering. By trying to squeeze out a maximum number of Republican districts by splitting up much of Austin and San Antonio and stretching them out to more solidly Republican areas, it could potentially mean a more competitive race in a big wave year. "It's the very definition of gerrymandering," Theriault said. "By slicing up all those Democrats in San Antonio and Austin, they're able to have lots of Republicans in this area when you think of this as being a pretty progressive Democratic area." Smith was reelected with at least 60 percent of the vote until 2016 when he dipped below that for the first time. In this election, Democrats see an opportunity to mobilize their base around gerrymandering as a measure that dilutes their votes, contends Jim Henson of The Texas Political Project who has conducted polling on gerrymandering. "Because of the way that politics have evolved in the state, you know, over the last couple of decades," he said, "all of these voting and election-related issues have become more salient and more partisan, particularly for Democrats." Smith has been a conservative Republican, voting for President Trump's tax plan and taking a hard line on immigration. Smith is also a climate-change skeptic, who serves as chair of the Committee on Science, Space and Technology, which oversees the Environmental Protection Agency. "He straddles this line between the Republican establishment and kind of the new Tea Party Republicans," Theriault said. The Republican running to replace Smith would be just as conservative. If Chip Roy wins, he would be a leading conservative in Congress. The former federal prosecutor, who also worked for Texas Sen. Ted Cruz, has faced criticism, because he doesn't actually live in the district. The Trump factor is a complicated one here, too, as Roy has campaigned carefully so that he is not tied too closely to Trump. "Of course I disagree with the president on certain policies, but I think you've got to look at the overall package and say, 'Is the president leading?' And give the president the room to lead," Roy told KXAN-TV in Austin. "And I think a lot of people in Congress, including Sen. Cruz and others, are giving the president the room to step out and lead and drive forward, and we're seeing the benefit of that." Roy will face a Democrat who used to be a Republican. Joseph Kopser is president of Grayline Group, a tech analytics firm based in Austin, and an Army veteran who served in Iraq. "He's a pretty moderate Democrat. He knows how to solve problems," Theriault said. "He has a veteran's pedigree, and so he appeals to the voters that he's going to need to attract in order for him to pull out this race." Kopser is hoping to fire up the very same Democrats that Senate candidate Beto O'Rourke hopes will turn out for him in the tight race against Cruz. "I not only share their progressive values of things we've fought so hard for over the years," Kopser told KXAN-TV, "but doing that in a way that will allow independents and those orphaned Republicans who are just so estranged by their party today — they don't even recognize the Texas Republicans of today – to be able to say, 'You know what, we want calm out of the chaos.' "
Democrats across the state are also aiming to capitalize on an 84 percent increase in Democratic voter turnout during the Texas primaries earlier this year, according to The Cook Political Report. "That jump was yet another metric of heightened Democratic enthusiasm and intensity, key elements when partisan wave elections occur," political analyst Charlie Cook wrote. "Having said that, some Democrats are overhyping what happened, forgetting that Texas is still Texas, and that for every two Democrats who voted, three Republicans cast ballots." Many voters in this district seem to have their minds made up, even though some don't even know the names of the candidates. Aaron Bird, who was running a trail along the Colorado River in Austin, said he is voting for Democrats up and down the ballot, because he is dissatisfied with Trump and the way he treats women. "I think it all starts with I have two girls and a wife," he said. "I think it's just having someone who represents us in a dignified manner." Another voter walking the trail, Laura Hubbard, also plans to vote all blue, because she said Democrats align with her values, namely, "having people that we can trust and what they say is believable. Honesty, transparency, giving all people a voice." But travel southwest of Austin and voters have a different outlook. Cheryl Poulus, for example, said she always votes Republican, and this congressional race is no exception. She's a big Trump supporter, and said she wants to do whatever she can to support his agenda. "I like how he's reaching out to all the different leaders," Poulus said. "I love the trade wars. I think that's gonna be OK. I think it's shaking things up a bit, shaking up the status quo, and then actually it will probably come back to be very good in the end." This race, like many around the country, isn't necessarily about the candidates, but the parties they represent. That means Kopser's fate could rest on how well O'Rourke does in getting people out to the polls, Theriault said. "They're cut from a very similar cloth," he said. "When you hear them speak, they don't sound like some of these other candidates that are getting the national headlines because of their strident liberal positions, but rather they seem like common-sense, problem-solving Democrats." Theriault added that the way Republicans redrew the districts in recent years could backfire and actually help Democrats in this election. "The problem for the Republicans when they do this is if we start talking about a 10-point wave year," he says, "all of those districts suddenly become competitive in a way that no one would have thought they would be competitive two years ago."